Red text --> of the note. High correlations among predictors indicate it is likely that there will be a problem with multicollinearity. 2 Beta is statistically significance in a range from 1 to +1. Multiple correlation coefficient R=0,571 . Indicates that 29,2% of the variance can be predicted from the independent variables. The Model Summary table shows that the multiple correlation coefficient (R), using all the predictors simultaneously, is 0,571 (R2=0,326) and the adjusted R2is 0,292, meaning that 29,2% of the variance can be predicted from the independent variables. 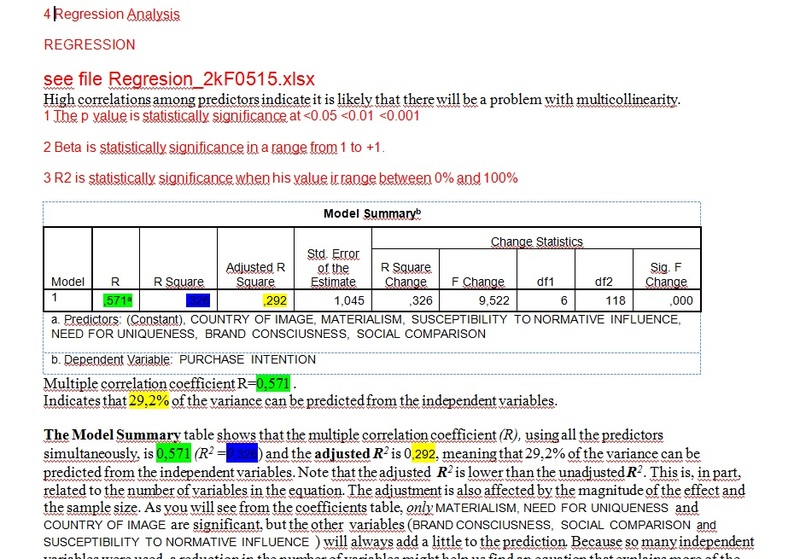 Note that the adjusted R2 is lower than the unadjusted R2. This is, in part, related to the number of variables in the equation. The adjustment is also affected by the magnitude of the effect and the sample size. 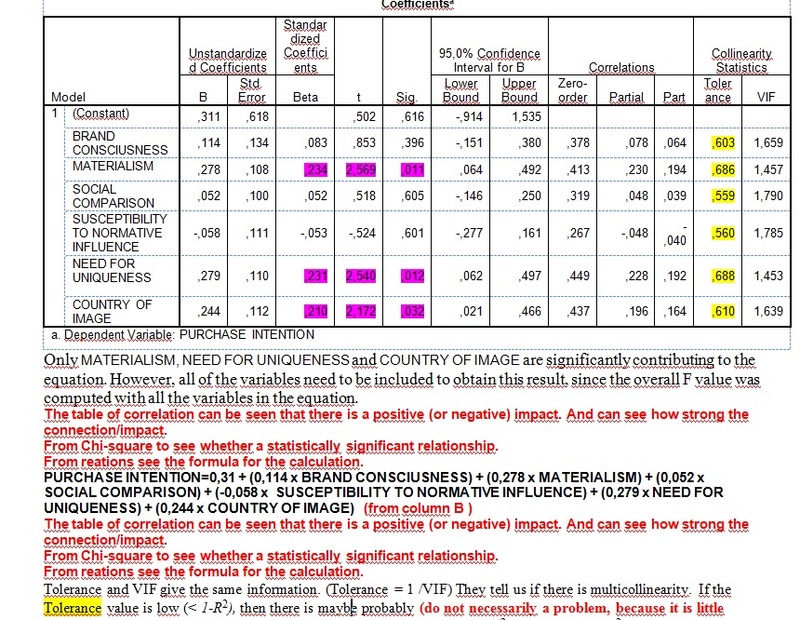 As you will see from the coefficients table, only MATERIALISM, NEED FOR UNIQUENESS and COUNTRY OF IMAGEare significant, but the other variables (BRAND CONSCIUSNESS, SOCIAL COMPARISON and SUSCEPTIBILITY TO NORMATIVE INFLUENCE ) will always add a little to the prediction. Because so many independent variables were used, a reduction in the number of variables might help us find an equation that explains more of the variance in the dependent variable. It is helpful to use the concept of parsimony with multiple regression, and use the smallest number of predictors needed. Indicates that the combination of these variables significantly (p <0 ,001) predicts the dependent variable. The ANOVA table shows that F= 9,522 and is significant. This indicates that the combination of the predictors significantly predict PURCHASE INTENTION. Only MATERIALISM, NEED FOR UNIQUENESSand COUNTRY OF IMAGEare significantly contributing to the equation. However, all of the variables need to be included to obtain this result, since the overall F value was computed with all the variables in the equation. The table of correlation can be seen that there is a positive (or negative) impact. And can see how strong the connection/impact. From Chi-square to see whether a statistically significant relationship. From reations see the formula for the calculation. Tolerance and VIF give the same information. (Tolerance = 1 /VIF) They tell us if there is multicollinearity. If the Tolerance value is low (< 1-R2), then there is maybe probably (do not necessarily a problem, because it is little difference ) a problem with multicollinearity. In this case, since adjusted R2 is 0.326, and 1- R2 is about 0.674, then tolerances are low for BRAND CONSCIUSNESS, SOCIAL COMPARISON and COUNTRY OF IMAGE. One of the most important tables is the Coefficients table. It indicates the standardized beta coefficients. The t value and the Sig opposite each independent variable indicates whether that variable is significantly contributing to the equation for predicting PURCHASE INTENTION from the whole set of predictors. Thus, MATERIALISM, NEED FOR UNIQUENESSand COUNTRY OF IMAGE, in this example, are the only variables that are significantly adding anything to the prediction when the other variables (BRAND CONSCIUSNESS, SOCIAL COMPARISON and SUSCEPTIBILITY TO NORMATIVE INFLUENCE ) are already considered. It is important to note that all the variables are being considered together when these values are computed. Therefore, if you delete one of the predictors that is not significant, it can affect the levels of significance for other predictors. This tells you how much each variable is contributing to any collinearity in the model.